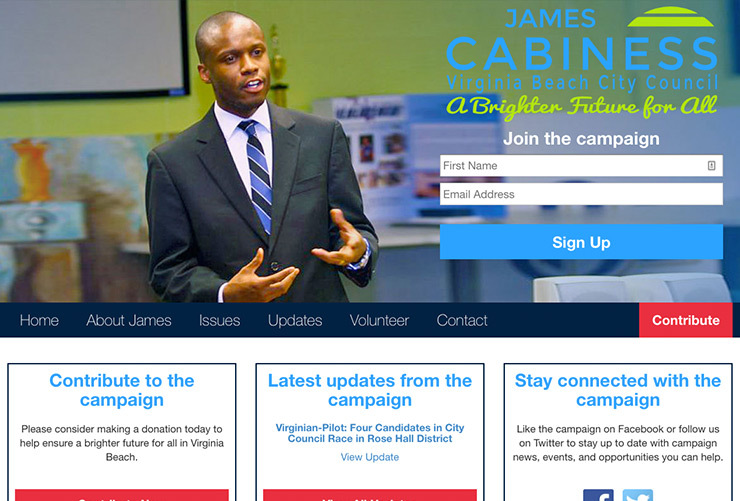 James Cabiness ran for Virginia Beach City Council in 2010 and 2014. While he, unfortunately, did not win his campaigns, this website for his 2014 campaign remains one of my favorites. I designed the campaign logo, designed the website, and developed the website for WordPress. The color scheme of everything was really inspired by the photo used as the hero image of the website. I vaguely member pulling colors out of the image and using them to make decisions on the logo and site colors. Like many of my campaign sites for local candidates, Gravity Forms is the workhorse of the site, submitting all data entered by users to MailChimp for future communications, contribution asks, etc.